7+C, S wind, smells of spring. Every Saturday, I get the same headache. What is this- cumulative lack of sleep, stress from work? What can be done to fix it? Had a good day at work yesterday- its was the DofE taster day in Sutton Park. Hard work, non-stop but refreshing. The sun shone, the spirit lifted and skin toned. All smells of spring reminding me of the simple pleasure of hiking and camping. Easter- Wales, summer- the Highlands. This year, I will do the things that can’t be done if you have a dog – Trifan and others. I hope to find another dog in my life this summer. If it were just me, I’d have two. Wouldn’t it be wonderful to have two poodles from the same litter. 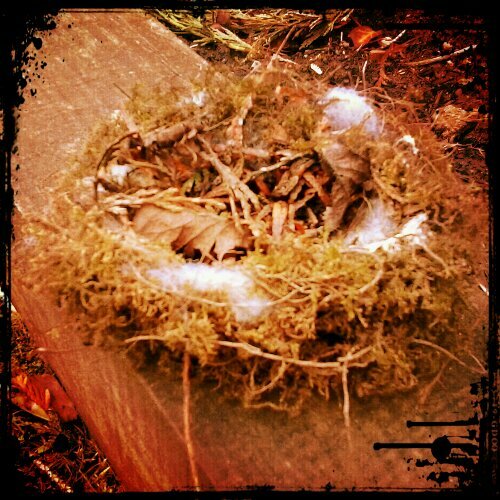 Found a bird’s nest in the garden. It’s made of bits of spruce, dry moss, and white fluff. The fluff could easily be sheep’s wool, or even some synthetic stuffing. I can only presume the nest blew out of the hedge in recent gales. This entry was posted in Health and tagged headache, Saturday. Bookmark the permalink.